There are just five Spectacular Summer Blog Hop posts to go and today we’ve got another creative variation on the quintessential back-to-school photo prop. 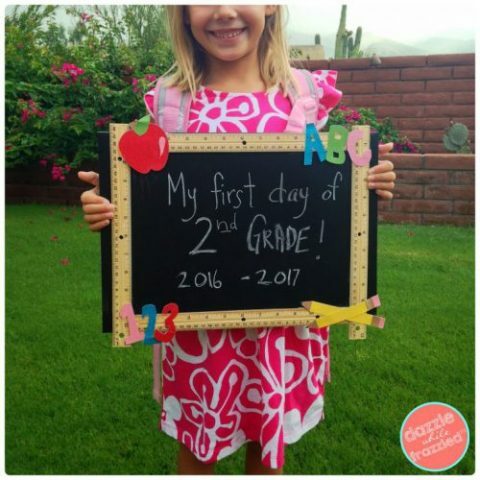 Dazzle While Frazzled has a simple and super-cute tutorial for a DIY chalkboard sign for those first-day photos. I would love to see this get sent in as a little gift for the teacher – I know I plan to take some achievement photos with my students this year to post in the classroom! With Santa Claus being less of the reason for the season, we began to spend Christmas going on vacations. One of my favourite memories was spending the holidays on a cruise ship and trying my first egg nog with brandy. Find all the #SpectacularSummerBlogHop Posts here!